The Volkswagen Beetle convertible is easily one of the most beloved and recognizable cars in the history of the automobile. Beetles have been known for their reliability and are notoriously fun and easy to work on. After VW relaunched the Beetle in the late ‘90s, Volkswagen has continuously outdone itself with its redesigning of the Beetle convertible tops to be more lightweight while improving durability and style. If you are fortunate enough to own one of the Beetle convertibles made between 2003 and 2010, while you may love your car, it may be time to consider looking into a new top to spruce up your favorite ride. Or maybe even a new color? At Auto Tops Direct, some of our best sellers are the Haartz Stayfast convertible tops for the 2003-2010 Volkswagen Beetles with several colors to choose from. The Haartz Stayfast line is made with a durable canvas material that is resistant to molds and mildews as well as exposure to extreme weather. These convertible tops come equipped with a glass window that is stitched and then heat sealed using a special bonding agent created by 3M engineers. The glass window has defroster wiring included, and the window bonding has a lifetime warranty against leaks. This convertible top includes everything you’ll need and is ready to install right out of the box. We’re proud to offer this quality product as the best replacement top on the market for 2003-2010 VW Beetle convertibles. These soft tops are made using manufacturer’s specs with the same factory-style fasteners and retainer attachments to ensure a perfect OEM fit. The entire top is a three-ply structure made of the Haartz Stayfast canvas fabric, an inner layer of rubber and a cotton lining. 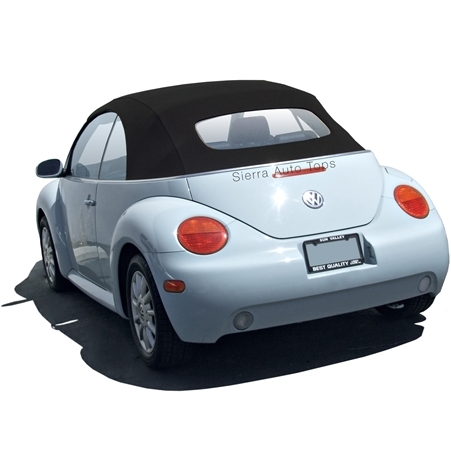 If you need a new convertible top for your 2003-2010 VW Beetle, make sure to consider a new color to give your Beetle a completely new look and visit our site to find the best prices on Volkswagen convertible car tops with the most knowledgeable customer service. Feel free to give us a call at 888-254-7679.